So there is this new guy you have been seeing lately but can’t remember inviting him into your android smartphone. The guy is really annoying. Well it’s not a real human being. It is a smartphone application. Once your data is switched on, it comes up, and goes on its own. You have tried to uninstall it but can’t find it. You also can’t find it among the list of apps on your phone. “What should I do now? Let me go for an antivirus, maybe I will find it as a virus and flush it out in the process.” This won’t work either. The guy is a virus. That guy is a malware but no antivirus will see it that way. You won’t notice the installation. But it acts as a normal application that is why an antivirus won’t find it. It takes the form of a browser (but it’s nameless). When you switch on data, this app displays silly deceptive ads. The application interrupts your work at anytime which can be very annoying at times. It uses your data without your permission to show you nothing but ads you don’t even want to see while running down your battery in the process. The most annoying part is that this app is nameless – it does not have a name. So when you try to find it under running apps all you see is a blank window or an ad space (of an app) without a name. You can uninstall this app without having to factory reset your smartphone; of course that can be a lot of (time wasting) work. This app enters your phone while you are browsing so to prevent it from entering your phone, you need to set up ad block on every single browser on your phone. Prevention is better than cure. So I heard. 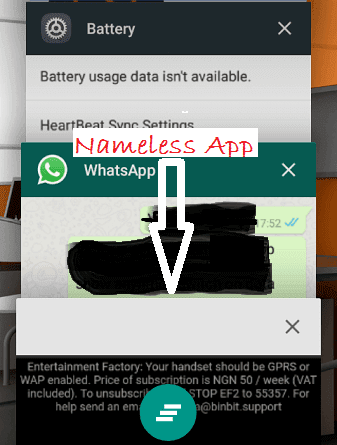 Let’s see how to stop, disable and remove or uninstall the nameless app. Why just disable and leave it there if you can just uninstall it and have your phone back? The truth is, makers of such applications might just develop another way of making uninstall more difficult. And secondly, there is not just one nameless app in the world. Once this is done, the application will be unable to come up while you are doing other things. In fact, it won’t even show up though it will still remain in your phone. But with background data enabled, you will have issues using your Play Store. The best way would be to uninstall and remove the nameless app completely. Also, be careful what you click on when browsing. Your phone is free, hallelujah! If you have questions, please use the comment session below - let’s talk. Indian Browser is 1st Made in India browser developed by patriot Indian Company in supporting Make in India movement. So please support Indian Browser at maximum level. Indian Browser is a 1st full fledge browser in its kind.